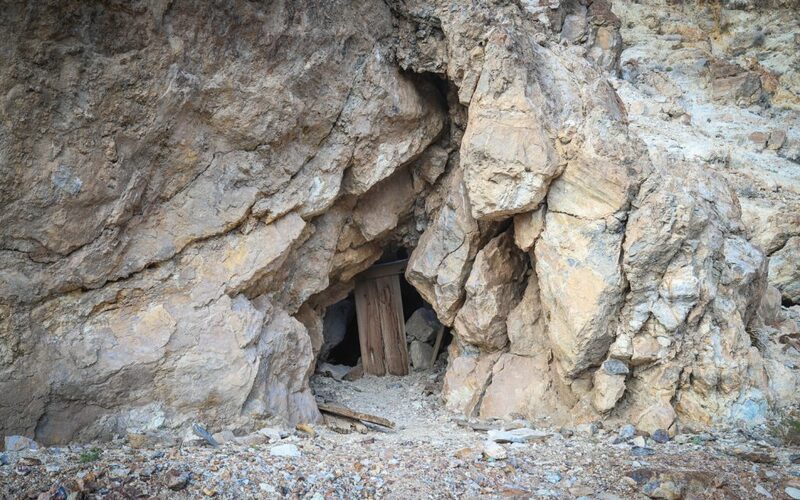 An abandoned gold mine in the Eastern California mountains with an extensive underground network of tunnels and adits. 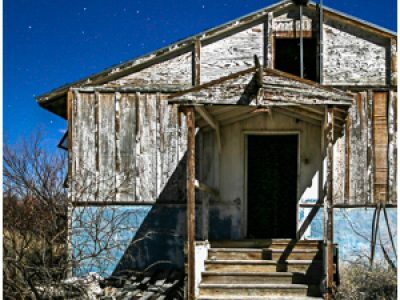 The site today known as the Reward Mine is made up of multiple mining claims that have merged over time, though which today sit in a mostly abandoned state. 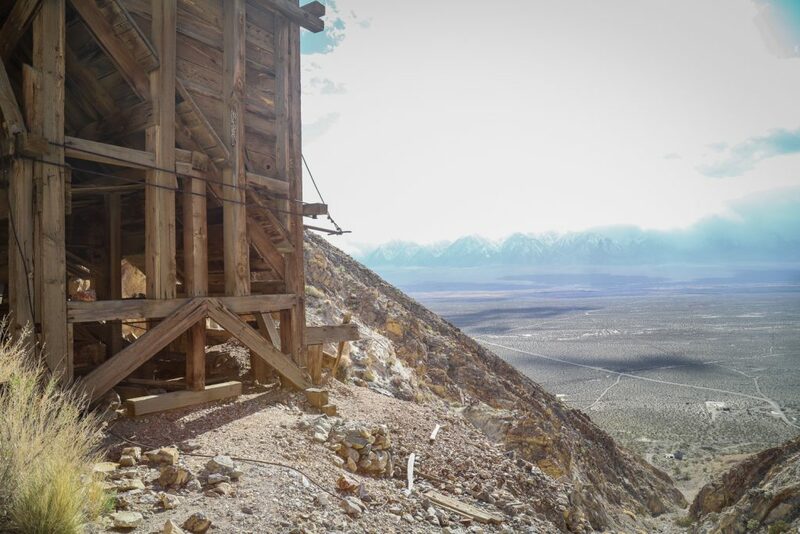 Following its discovery in 1870, the Reward Mine primarily produced gold and silver, with copper and lead being secondary minerals mined from the mountain shafts located in the Eclipse Canyon area of California’s Inyo Mountains overlooking the Owens River Valley. 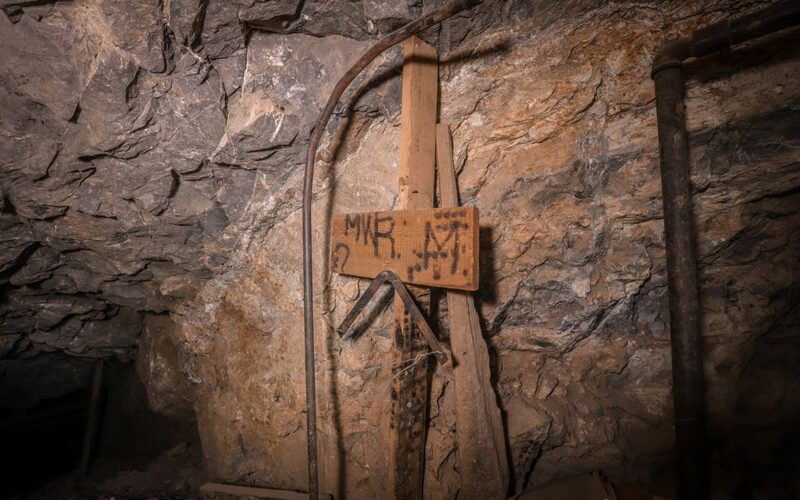 At an elevation of 4000′, the Reward Mine sat adjacent to the Brown Monster Mine, each working veins named after their respective operations and adding tunnels over the years, with the largest production occurring from 1911 until 1952. 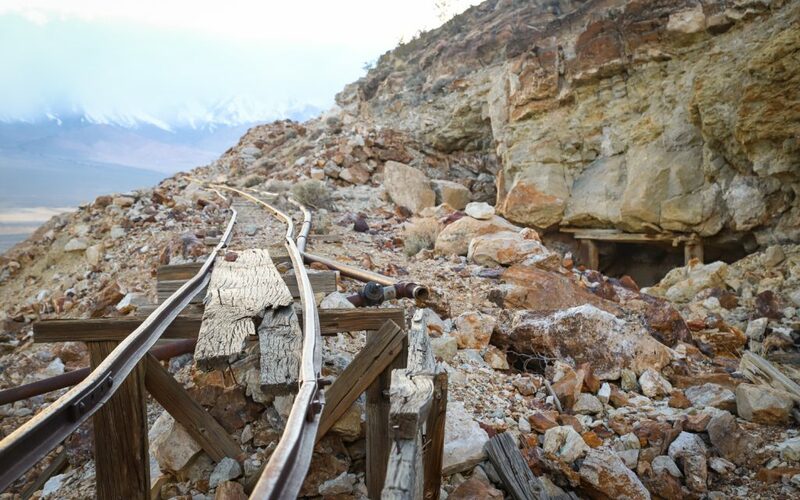 The two mines combined to be the major producers of lode gold in the Union District (comprised of the area of the Inyo Mountains east of the town of Lone Pine) from the mine openings until 1959 when large operations ceased. 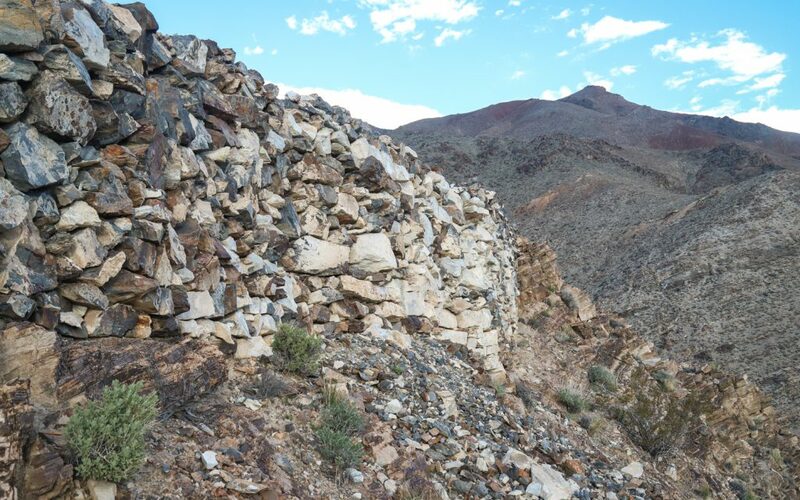 During the early period, ore was shipped to the Tropico Mill in the town of Rosamond located near Lancaster in Southern California’s Antelope Valley. 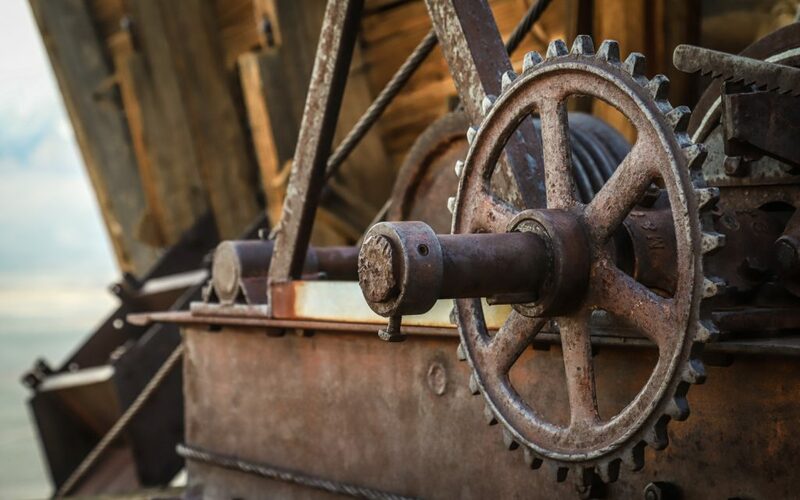 Eventually a small mill was constructed onsite that could handle between 1.25 and 1.5 tons of ore per hour. 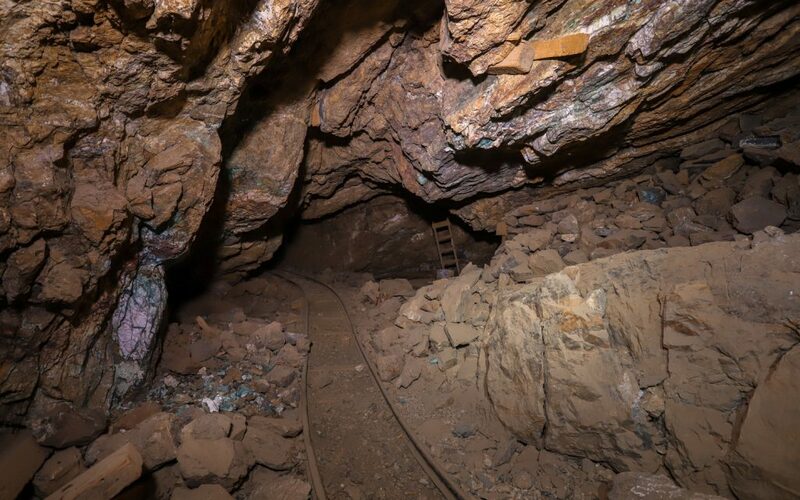 The Reward Mine was set around a vein about 150′ to 300′ long and 6 feet thick with gold and lead, while the Brown Monster’s operations worked a 150′ to 200′ long vein ranging between 4 and 12 feet thick. 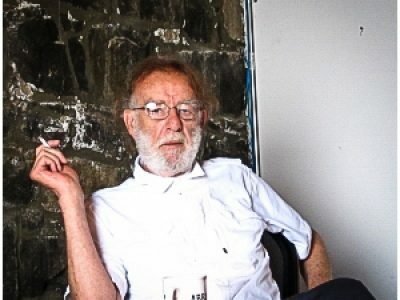 In 1948, then mine owner, T.L. 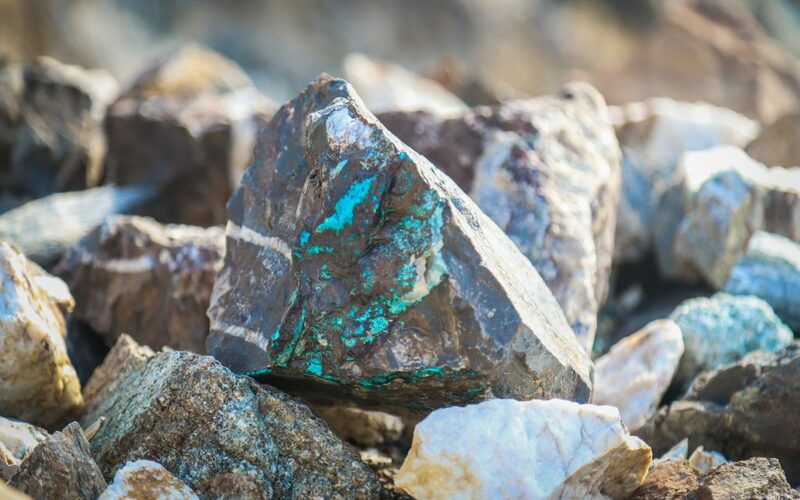 Bright reported daily production of 10 tons, with ore reportedly assaying at $100-150 per ton. Over time, a cable system was built to transport ore from the higher elevation shafts to the mill site nearer the base of the canyon. 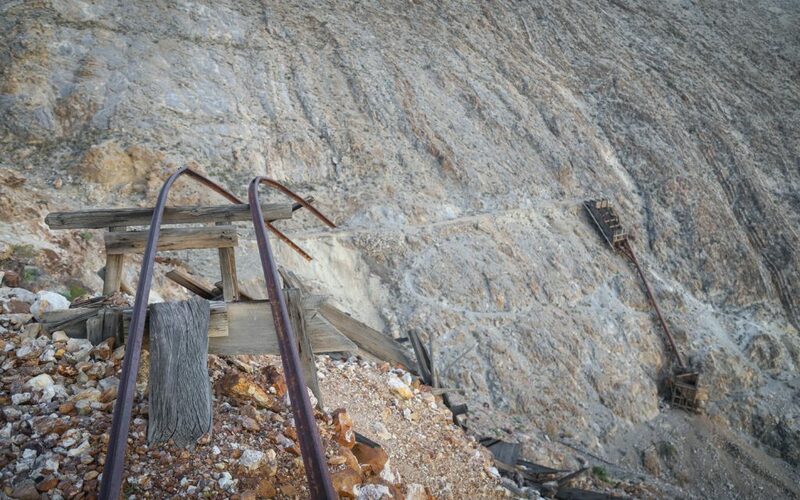 Reaching the mine site requires a steep climb over tailings piles that display the variety of minerals present in the rock. 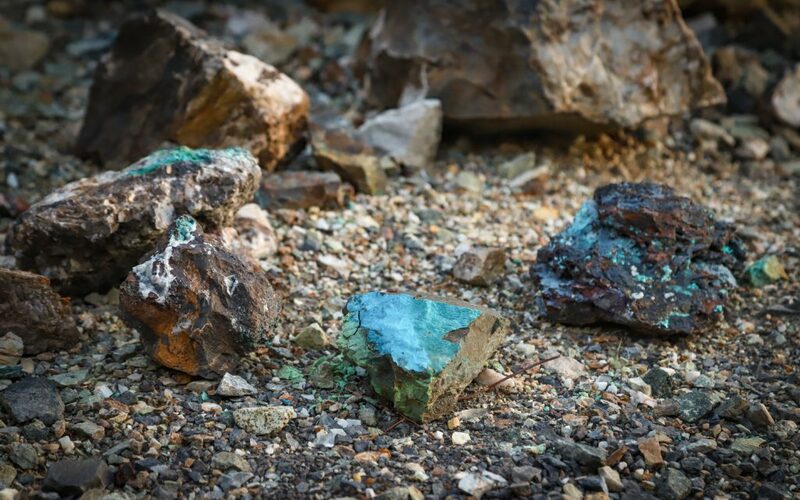 Ore present includes chrysocolla, quartz, calcite, jasper and anglesite. 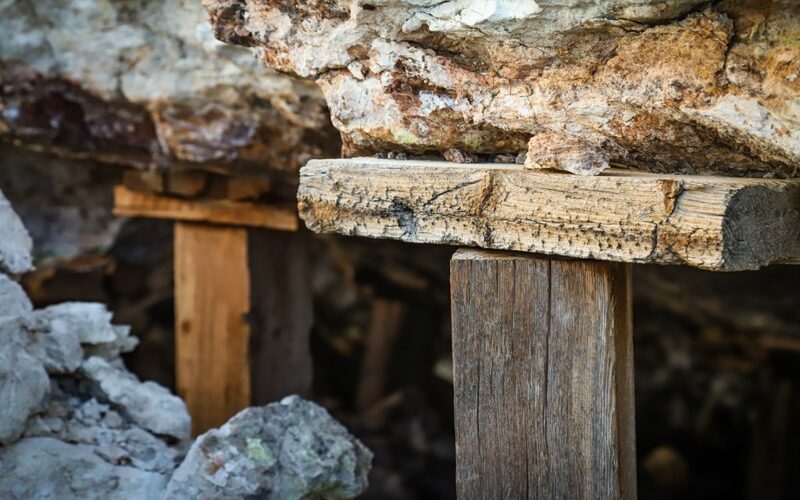 The remains of the mines have left a dispersed network of open shafts throughout the mountainside, along with old mill, walkway and cable tram structures. 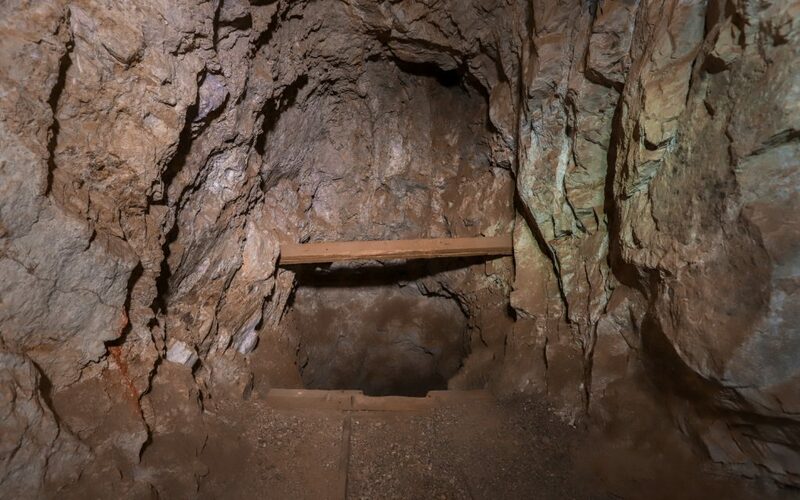 While the main network of tunnels is made up of 8 levels of underground adits running along an inclined shaft – stretching about 500 feet from top to bottom – one larger tunnel added relatively late in the mine’s existence after the use of vehicles in mining operations became more common tends to be the most popular area among 4WD traffic. 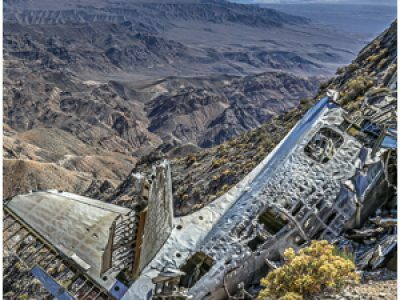 While portions of the mine continue to remain privately owned, as recently as 2017 Bureau of Land Management files show portions of the claim being abandoned, reverting back to BLM jurisdiction. 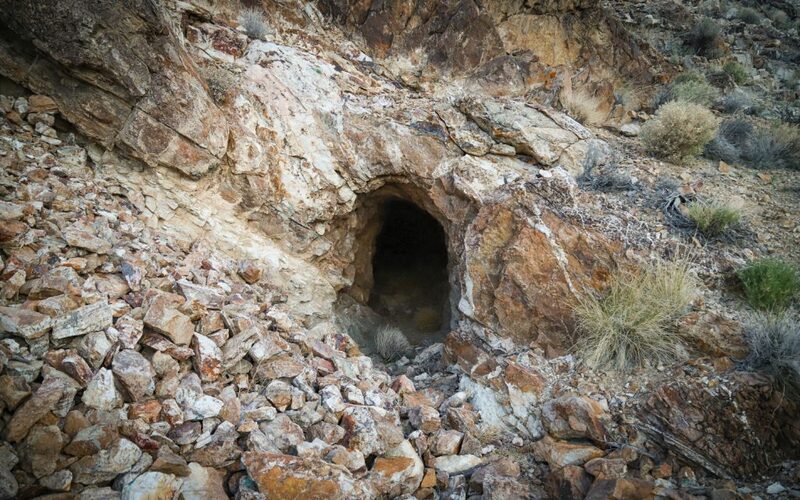 The Reward Mine today contains the remains of a mill with several dispersed open shafts. 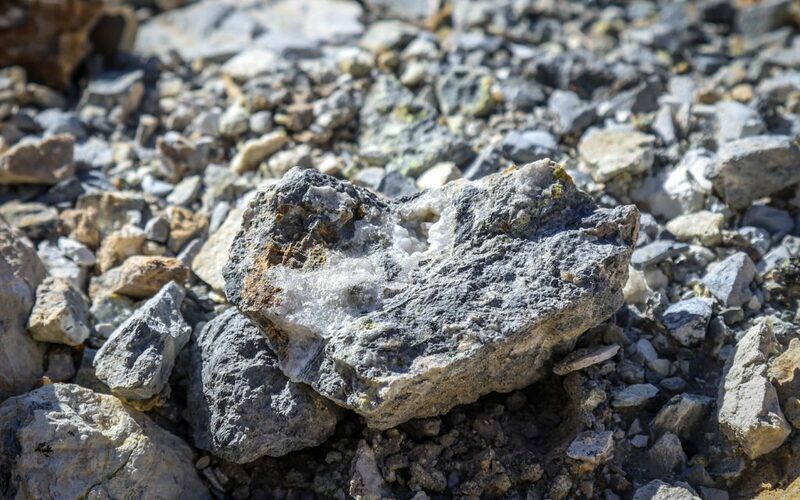 Quartz is amongst the variety of ore present throughout the mining area. 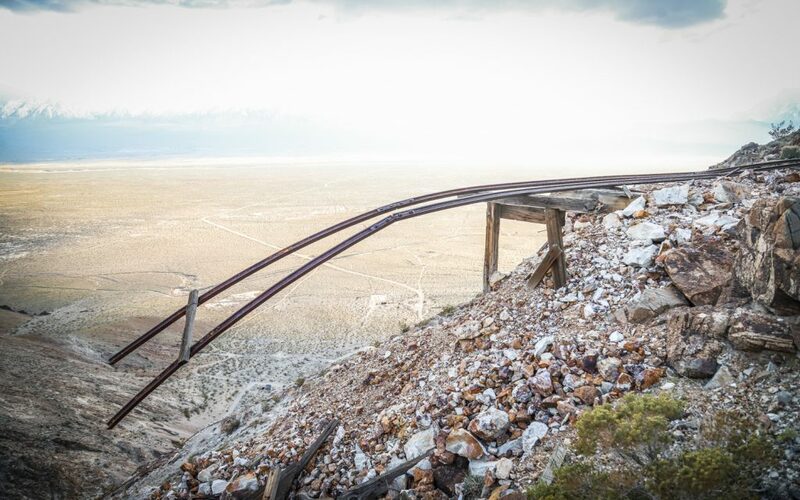 The mine area overlooks the Owens River Valley and Eastern Sierra Nevada. 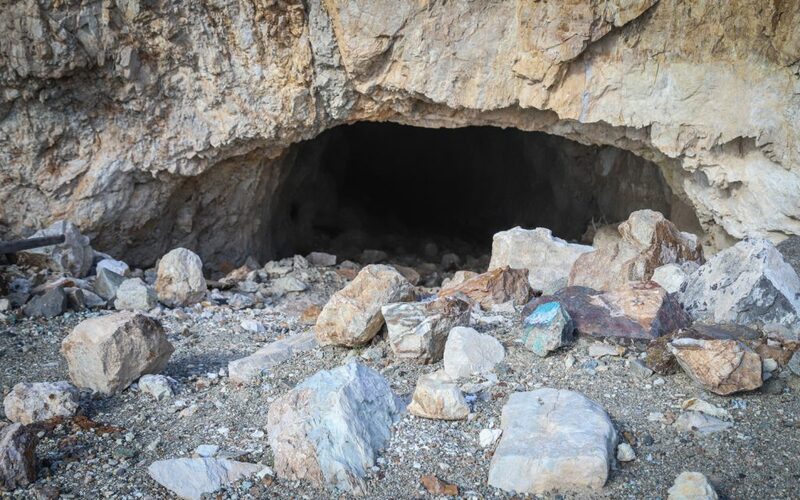 The area spans about 500 feet in elevation from the mill at the bottom of Eclipse Canyon to the shafts and cable tram structures at the upper areas of the mine. 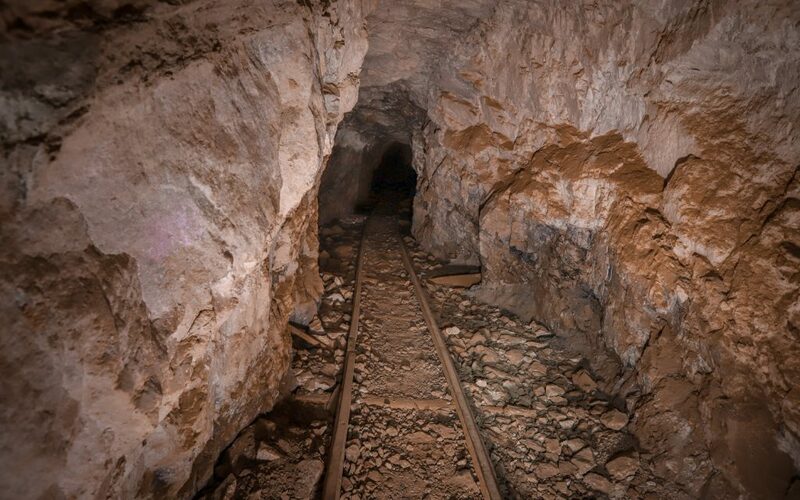 An open tunnel of the former Brown Monster Mine. 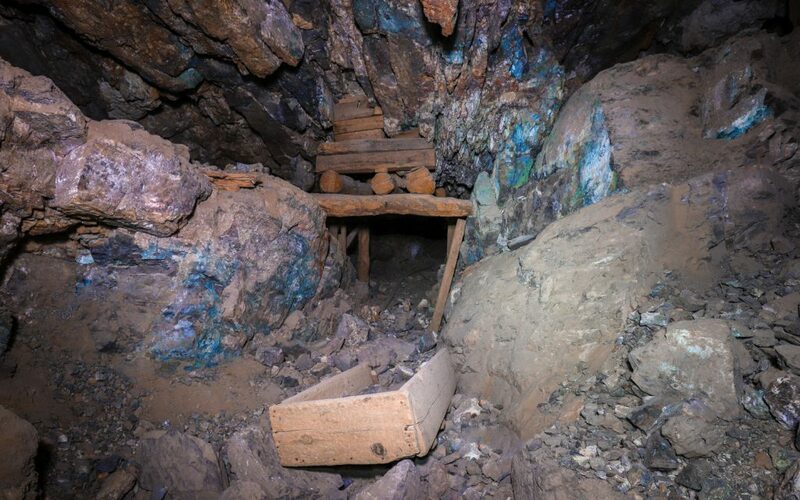 The interior of the mine is a network of tunnels spanning multiple levels. 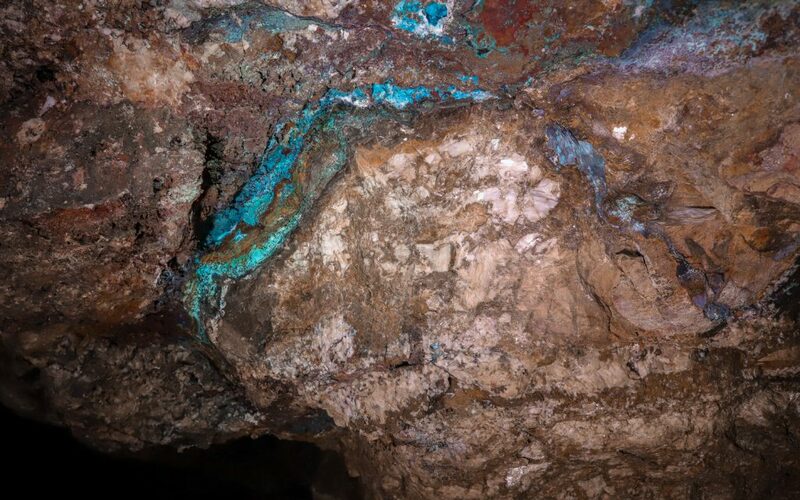 Mineral present inside the Reward Mine. 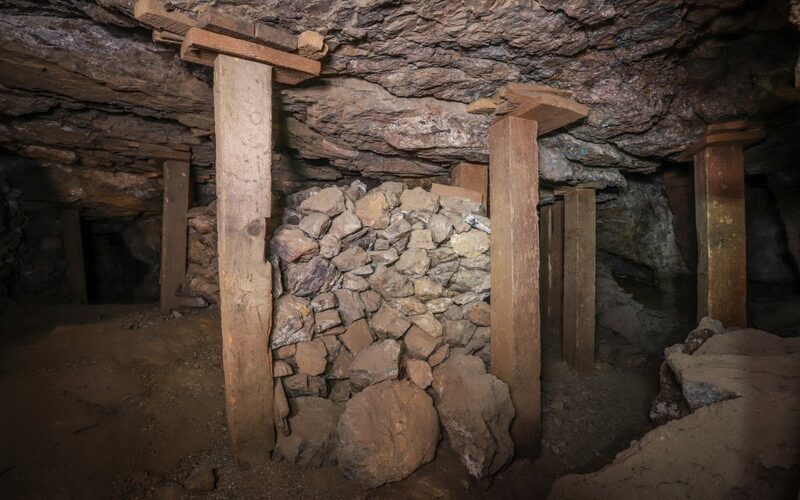 The mines have left numerous open shafts ranging from horizontal to vertical in the area. Mineral in stone pulled from the mine. 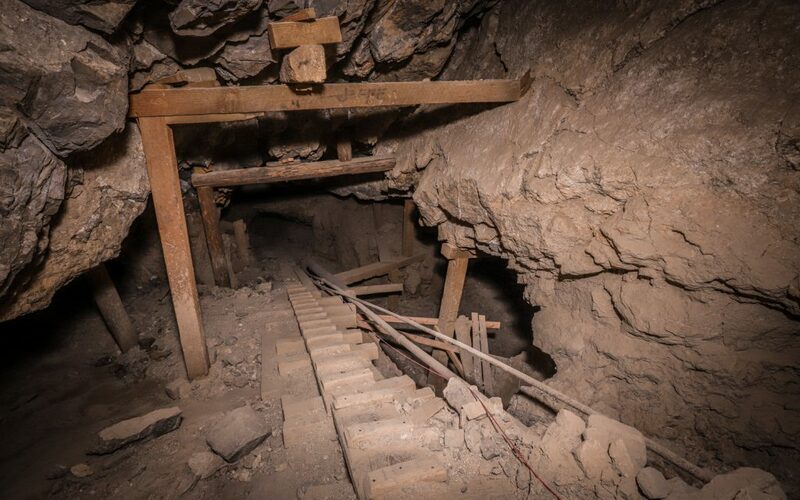 Ore cart rails and ladders inside the Reward Mine. 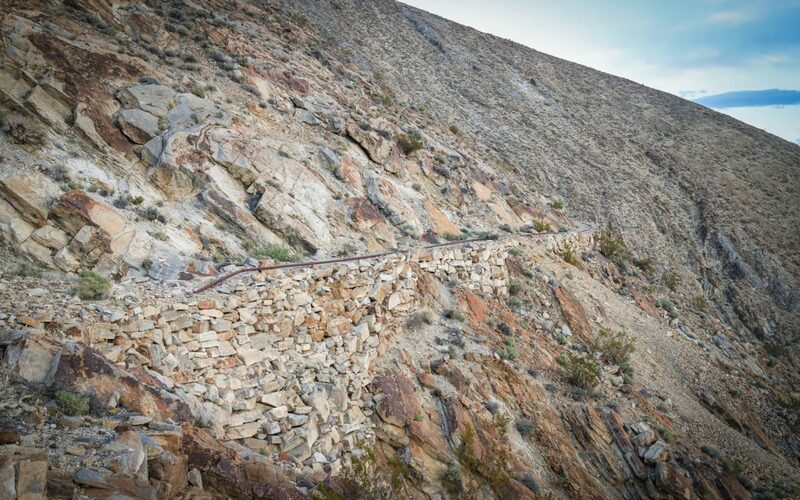 A wall built to ease walking along the canyon’s steep slopes. 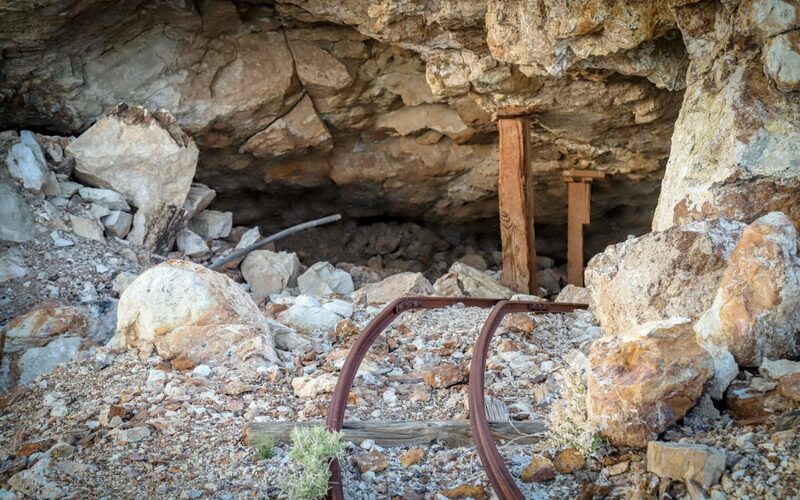 An open shaft of the Reward Mine beside ore cart tracks leading to the former site of the cable tram. 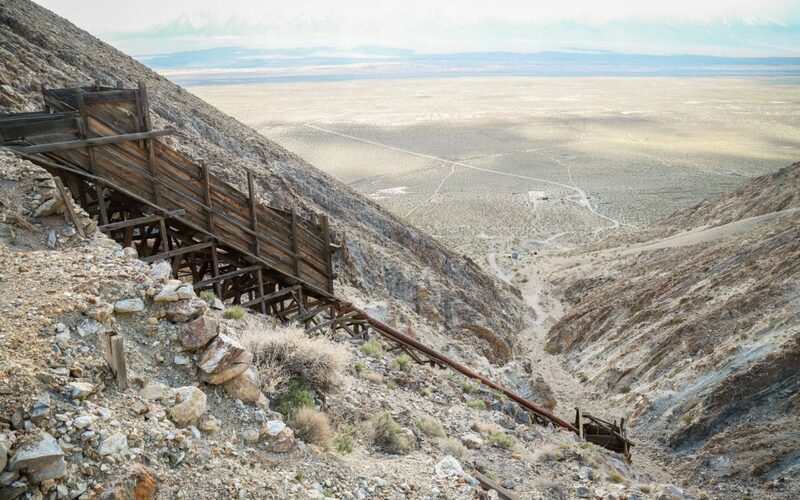 Abandoned ore cart rails perched over Eclipse Canyon at the Reward Mine. Stone structure foundation outside the Reward Mine. 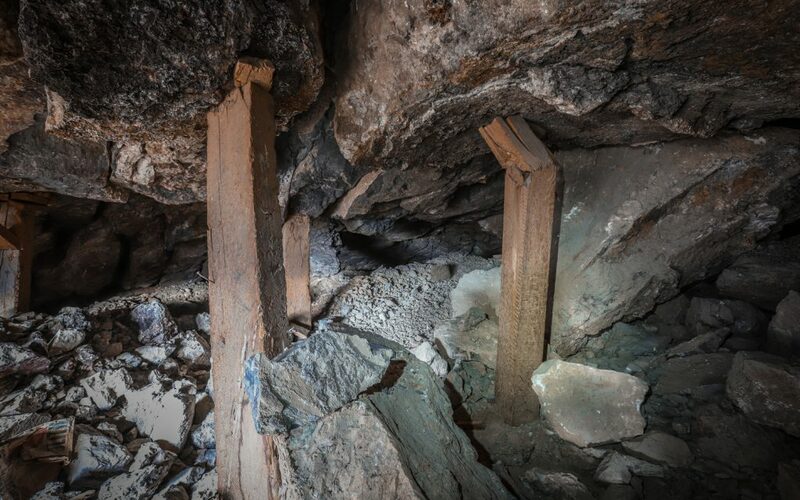 Wood joists were erected to support the stone slabs throughout the mines. 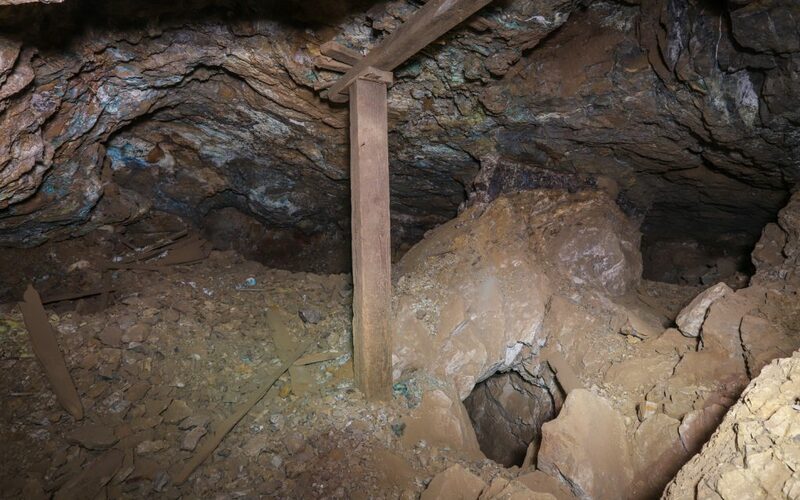 The incline shaft inside the Brown Monster Mine. Some of the support beams have not held up as well as others. 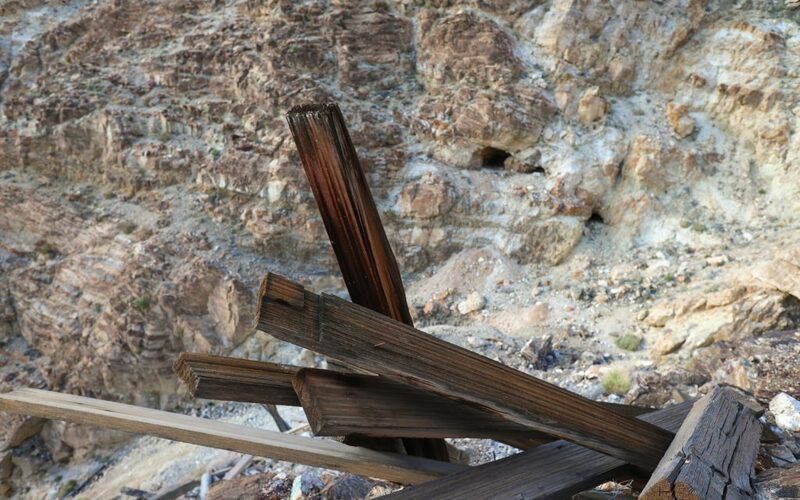 An open shaft of the Brown Monster Mine sits on the opposite canyon wall from this collapsed structure. This vertical shaft has seemingly no other access points, yet rocks thrown down here fall and echo for about 11 seconds. 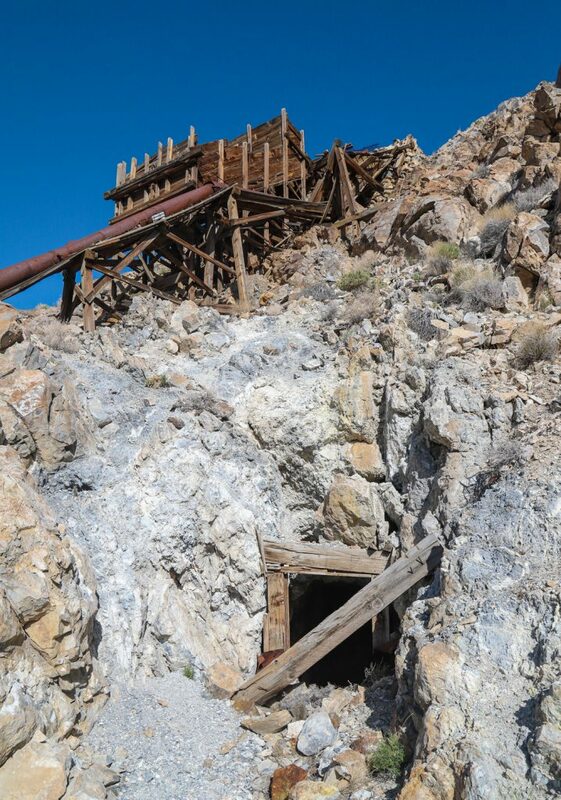 During its use, the mine was operated by three men, while one more operated the mill at the canyon bottom. 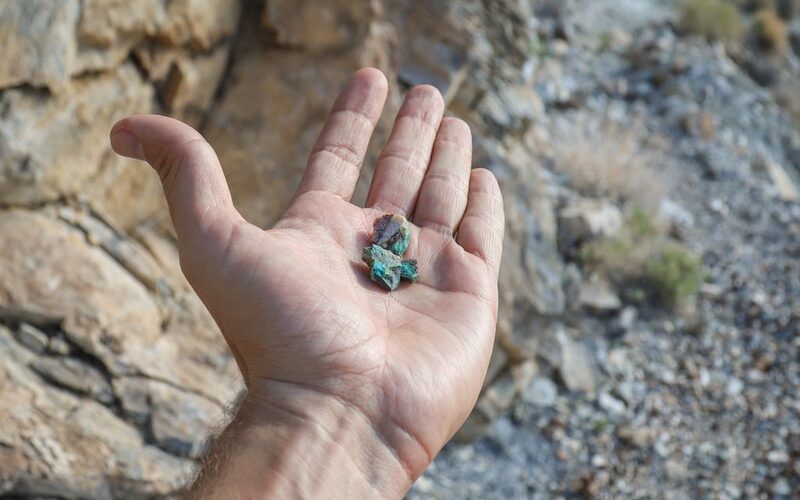 Reward and Brown Monster Mines in California’s Inyo Mountains.